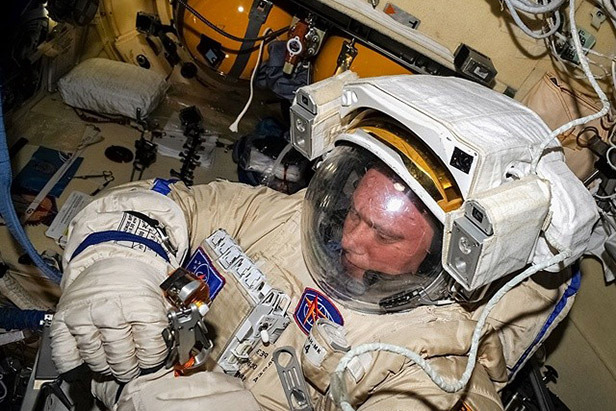 Oleg Artemyev is a Russian member of the Expedition 39/Expedition 40 long-duration International Space Station crew. The mission is scheduled to last until September 2014. During all this period Oleg will make posts with ''all things space'' to his personal blog, a twitter account and an instagram account. Because the lack of gravity tends to make people float, harnesses are attached to the astronauts to hold them to the walking surface. The sun is actually white when observed without any air between the viewer and the sun, so, sunlight in outer space contains a mixture of violets, blues, greens, yellows, oranges, and reds. Kulonovskiy Kristall studies charged particles in a magnetic field. Scientists try to study the dispersed material control features using a magnetic field in microgravity. Putting a spacesuit on is called "donning" the suit. Removing the suit is called "doffing." A human without the spacesuit can survive up to 2 minutes in space. Astronauts usually use tethers to keep them attached to the spacecraft while on a spacewalk. The first undeterred spacewalk was by American astronaut Bruce McCandless, Jr., on Feb. 7, 1984, during Challenger mission STS-41-B. The dancing lights of the aurora provide spectacular views on the ground, but also capture the imagination of scientists who study incoming energy and particles from the sun. A docking mechanism is used when one spacecraft actively maneuvers under its own propulsion to connect to another spacecraft, in this case, to the International Space Station. Lake Urmia is a salt lake in northwestern Iran near Iran's border with Turkey. At its full size, it is the largest lake in the Middle East and the sixth largest saltwater lake on Earth. Astronauts eat three meals a day (plus periodic snacks), just as they do on Earth. Meals are organized by the order in which astronauts are going to eat them and stored in locker trays held by a net so they won't float away. When mealtime rolls around, astronauts go into the galley area. There they add water to freeze-dried foods and dehydrated drinks from a rehydration station that dispenses both hot and cold water. They heat foods in a forced-air convection oven that's kept between 160 and 170 degrees Fahrenheit. It takes about 20 to 30 minutes to rehydrate and heat an average meal. To surf the Web, astronauts use a station laptop to control a desktop computer on Earth. This ground computer has the physical connection to the Internet. Every year the Moon moves about 3.8cm further away from the Earth. Tidal effects cause this. Consequently, the Earth is slowing in rotation by about 0.002 seconds per day per century. Scientists do not know how the moon was created, but the generally accepted theory suggests that a large Mars sized-object hit the earth causing the Moon to splinter off. Astronauts are involved in all aspects of assembly and on-orbit operations of the ISS and required to have a detailed knowledge of the ISS systems, as well as detailed knowledge of the operational characteristics, mission requirements and objectives, and supporting systems and equipment for each experiment on their assigned missions.